It has been another busy time for us. We pretty well have our apartment set up to where we like it more and will show some finished pics later. However, we did take our "Mission Car" (Opel Corsa) back to Berlin to the Mission Home to turn it in so someone else in need could use it to further the work. We got to Freiberg in time to meet with Jens Apel who owns Autohaus Apel. His brother is the bishop in Freiberg and we left the Mission Car with him for pick up - then we picked up our used lease car for us to use while we are on our mission. Seniors pay for their own car and gas anyway, so we decided to add some flexibility to our program by getting bigger car for my old bones. Brother Apel was really great to work with - no details, but it is seldom one can find anyone anywhere that does things on trust and a handshake. We expect it will take us another month - at least- before we can establish a German Bank Account and make the monthly payments. WOW. Never thought I'd own, rent, or drive a diesel, but here's another FIRST!!! This is a Nissan Qashqai - doubt they are available in America. 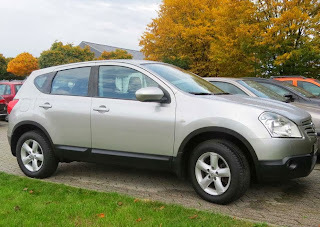 Somewhat similar to the Murano, but we have seen a Murano on the road over here. You should have seen Sr Porter on the Autobahn all the way to Frankfurt - she did GREAT. After we picked up the Nissan, as you can see by the handshake above - it was dark. We drove to the Freiberg Temple and took the picture to the left. It is VERY NICE as one would expect the temple grounds to be for the LDS Church. Below is a nice daytime pick of the temple, but didn't get Moroni in it. You can see we are not pros at pictures. while visiting Freiberg and attended temple sessions. Right is a picture of the Ward building (Gemeinde Haus). While in Freiberg, we took a quick day trip to Wurzen (near Leipzig) to visit two aunts of Brigitte's. Wurzen is a town with over a thousand years of history, but is still being slowly renovated after the unification of DDR with West Germany into one Germany. Just below is a pic of one of the streets as we entered the town. Aunt Eva, & Brigitte with Aunt Ruth who is in the hospital. Eva was married to Brigitte's Uncle Guenther who was the youngest brother of her father Kurt Max Priesnitz. Guenther & Eva visited us in Dallas shortly after we got there and the unification of Germany took place. We had a great time and they liked America very much. Guenther died some years ago and Eva has lived in Wurzen ever since. We went to lunch in a very good Asian restaurant and enjoyed talking about whatever came to mind. Eva is in her 80's and not interested in talking about the church, but we will do what we can for her as she is a great person. Some years after Guenther died, Eva met Harry who lives in Berlin. They met on a bus tour and have been friends ever since. Harry is very nice and they support each other with their illnesses and age related challenges. Harry guided Brigitte out of the little parking area on to the street so we could drive back to Freiberg. The next day we did a temple session in Freiberg, then hit the road for Frankfurt. It was about a 5 hours drive - usually 4, but the Garmin took us on a really convoluted road trip on very narrow roads. The country side was very pretty - the roads were not. We were trying to get to a place called Frankenberg, however, when we finally (after about an hour) got to the road to Frankenberg, it was under construction - so we got to use a detour. Now that was an experience - the road was so narrow, I don't think a bicycle could pass us by without one of us going into a ditch. We finally got to the freeway (Autobahn) and were finally sailing along at 120 Km/hr vs the 30-50 Km/hr we did (when we could) on the backroads of Freiberg area. We arrived at the Frankfurt Tempel about 5PM and were happy to be there. We also were able to stay in a hostel at the temple. Room for SIX. The hostel rooms are for rent at a very reasonable price to help pay for the cleaning of the linens, etc. We have to make our own beds, and clean up the place when we leave - and the shower and bathroom was down the hall. It was interesting as there were families who were staying in the building, but it was the only place available for two nights - so we took it. We met some VERY NICE folks who were staying there. There was one lady from Utah who had lived in Germany about 18 years. She had married a German fellow and it was a surprise to have someone start talking to us in US English. The spire from the temple. The grounds, etc. were also very nicely kept and make a great statement for the beauty of the church. This is a picture of the Temple Presidents villa - although other people who attend the temple also stay there. We could have stayed, but only for one night - so we chose the hostel. We had a nice dinner at a Chinese restaurant (Neun Drachen). It was very good to - we were with Hellmut and Ursula (Brigitte's brother-in-law & sister - they chose. Afterward we blew our diets out of the park at an Italian Ice Cream parlor in the area. I can't believe with all the bragging the Germans do on their chocolate - they don't know about HOT FUDGE!!! An opportunity raises its head!! The next day after two sessions in the Frankfurt Tempel and Hellmut and Uschi had finished their 'shift' as temple workers, we took a ride up to Feldberg. It is over 890 METERS (over 2900 feet). It was cloudy and WINDY!! We didn't have coats, but the view was spectacular. Afterward, we went into a restaurant (Hof) on top of the mountain, to warm up with a HOT chocolate. It was not disappointing - very good stuff. We had a wonderful opportunity to help out a pair of Elders who had an investigator coming to the Ward building to meet with them to discuss the restoration and the Book of Mormon. We were in the building using its wireless system to check on a few things with our iPads when them came over and asked if we could sit in on the lesson. We agreed readily and went into a room they use routinely for discussions. The lady is from Poland and working in Frankfurt to make a living. The Elders promised her a Book of Mormon in Polish cut had not brought one with them. As it turned out, their German was a bit weak, but Sr Porter jumped to the rescue and she and the lady from Poland got along wonderfully. I even got a change to explain what we mean by the restoration vs a reformation and some of the history and truths of the Book of Mormon. She had to leave t 3PM and that was when we were to meet Hellmut and Uschi to go up to Feldberg mountain. We were able to introduce her to Hellmut and Uschi and they wanted to also help her and the missionaries when she returned the next day. We left on the 18th to go back to WHV. It was a long trip, but it was stimulating to be in the temples of the Lord in Germany and to meet and interact with so many people. We have met a very nice young woman at a WHV copy/print shop. She talked English with us and said she had attended the Church's English classes and thought she would come back for a 'refresher'. We told her we are the teachers for the Wednesday night classes and we looked forward to her bringing her experience and personality to the meeting. no need to explain your tom-foolery. we all know what is really going down in the W-H-V. those <80,000 better watch out! gigi is back to the motherland!! !